MARINETTE, Wis. --- The future USS Billings (LCS 15) successfully completed its acceptance trials Dec. 7 after a series of graded in-port and underway demonstrations on the Great Lakes for the Navy's Board of Inspection and Survey. Acceptance trials is the last significant milestone before the ship is delivered to the Navy. 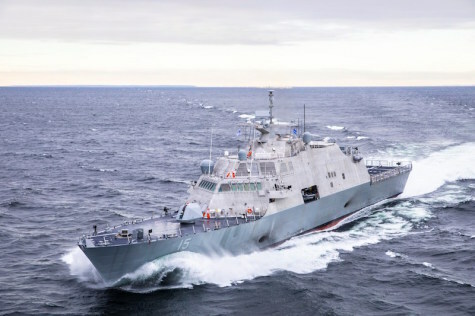 During the trial, the Navy conducted comprehensive tests of the Freedom-variant littoral combat ship (LCS) to demonstrate the performance of the propulsion plant, ship handling capabilities and auxiliary systems. Following delivery and commissioning, LCS 15 will sail to her Florida homeport in Mayport with sister ships USS Milwaukee (LCS 5), USS Detroit (LCS 7), USS Little Rock (LCS 9), USS Sioux City (LCS 11) and the future USS Wichita (LCS 13). Seven more Freedom-variant ships are under construction at Fincantieri Marinette Marine Corp. in Marinette, Wisconsin. The future USS Indianapolis (LCS 17) was christened in April, and the future USS St. Louis (LCS 19) is scheduled to be christened on December 15. Additional ships in the production phase include the future USS Minneapolis-St. Paul (LCS 21), Cooperstown (LCS 23), Marinette (LCS 25) and Nantucket (LCS 27), with Beloit (LCS 29) in the pre-production phase. LCS is a highly maneuverable, lethal and adaptable ship designed to support focused mine countermeasures, anti-submarine warfare and surface warfare missions. The Freedom-variant LCS integrates new technology and capability to affordably support current and future mission capability from deep water to the littorals. MARINETTE, Wis. --- Littoral Combat Ship (LCS) 15, the future USS Billings, completed Acceptance Trials in the waters of Lake Michigan. This is the ship's final significant milestone before delivery. LCS 15 is the eighth Freedom-variant LCS designed and built by the Lockheed Martin-led industry team, and is slated for delivery to the U.S. Navy next year. "LCS 15 is the third ship we've taken through sea trials this year, and we are proud that the Navy will soon have another capable, lethal and affordable ship in the fleet," said Joe DePietro, vice president and general manager, Small Combatants and Ship Systems, Lockheed Martin. "The industry team has hit its stride in serial production, and we're producing increasingly capable ships in quick succession." The Freedom-variant LCS integrates new technology and capability to affordably support current and future mission capability from deep water to the littorals. The Lockheed Martin-led Freedom team is in full-rate production and is continuing to deliver for the Navy. The USS Sioux City (LCS 11) was commissioned in Annapolis, Maryland, Nov. 17. The trials, included a full-power run, maneuverability testing, and surface and air detect-to-engage demonstrations of the ship's combat system. Major systems and features were demonstrated, including aviation support, small boat launch handling and recovery and machinery control and automation. LCS is a highly maneuverable, lethal and adaptable ship, designed to support focused missions including mine countermeasures, anti-submarine warfare and surface warfare missions. The Freedom-variant LCS integrates new technology and capability to affordably support current and future mission capability from deep water to the littorals. "I am extremely proud of our LCS team including our shipbuilders at Fincantieri Marinette Marine," said Jan Allman, Fincantieri Marinette Marine president and CEO. "These are complex vessels, and it takes a strong team effort to design, build and test these American warships." There are seven ships in various stages of production and test at Fincantieri Marinette Marine, where the Freedom-variant LCS is built. The next Freedom-variant in the class is LCS 17, the future USS Indianapolis, slated for sea trials in 2019. LCS 19 (St. Louis) is scheduled for christening and launch Dec. 15. Additionally, LCS 13 (Wichita) is scheduled for commissioning Jan. 12 in Jacksonville, Florida.